Of all the email apps I have used in recent years, Newton (formerly known as CloudMagic) is my favorite. It is really easy to use, works with all the major email providers, has some pretty cool features, and, most importantly, is available on Android, iOS and macOS. So it nearly covers all the major platforms, except Windows. CloudMagic, the company behind the app, has been working to change this since December, however, and now we get the first beta version of Newton for Windows. It is rough around the edges at this stage, as you might expect, but it will get the "core emailing" job done. The first Newton for Windows beta comes with a more basic feature set compared to the Newton experience that you get on other platforms, likely because CloudMagic wanted to release a working build as soon as possible, as it lacks "Superchargers," which are power features like read receipts, snooze, send later and so on. Those, CloudMagic says, will be added later down the road, but, right now, Newton gives you a clean Inbox with a design similar to the macOS client, a distraction-free conversation view, and a "blissful" writing mode. And, right now, it is only available to subscribers, running Windows 10 Anniversary Update or later. CloudMagic is distributing the Windows app through the Windows Store, so if you want to grab it you can search for "Newton Mail" or hit this link to take you straight to Newton's landing page in the official app store. That is not all that's new in the Newton land this week, as there is now an Alexa skill too. What can it do? You can check if you have new email, find out who sent it, have it read out loud, and manage it (mark it as read, archive it, snooze it and so on). 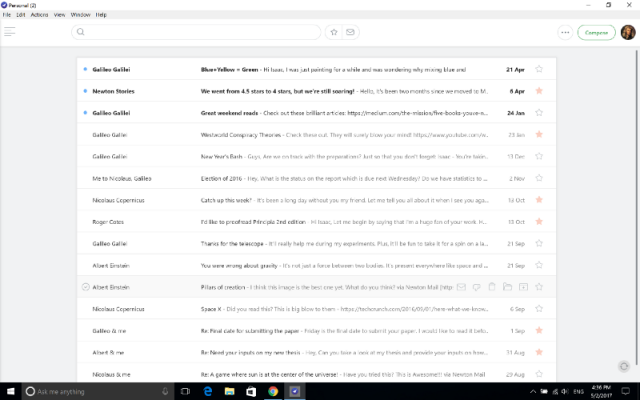 It is a pretty cool feature, which should make it easy to sort though your email without having to touch your phone.